Felt book, felt jewellery, pricing work and Clasheen Crafty Swap update ….. Following on from yesterday’s post about Carmen’s great new book ‘Dutch Felt’, I did an internet search this morning and discovered that it is available directly from the publishars Zijdar. When I get a few spare hours (whenever that is!) I am planning on trying out Ria’s ‘Heart rug’ project incorporating raw sheep’s wool, silk fabric and merino fibres amongst others. This looks like the perfect time to try once more some of the gorgeous Jacobs fleece kindly given to me by some neighbours this summer, I will keep you posted! Carmen came over yesterday afternoon and her visit provided an excellent excuse to stop tidying the studio in preparation for the weekend workshop and sit down together and string some felt jewellery. I pulled some of the colourful felt beads that I have made over the last while out of hiding and then spent some time selecting seed beads that would most do the felt justice. I always find it difficult to finish projects like these and definitely it is the little things that make the difference, it was SO much easier to have a drink and a chat while putting some of these items to bed once and for all! 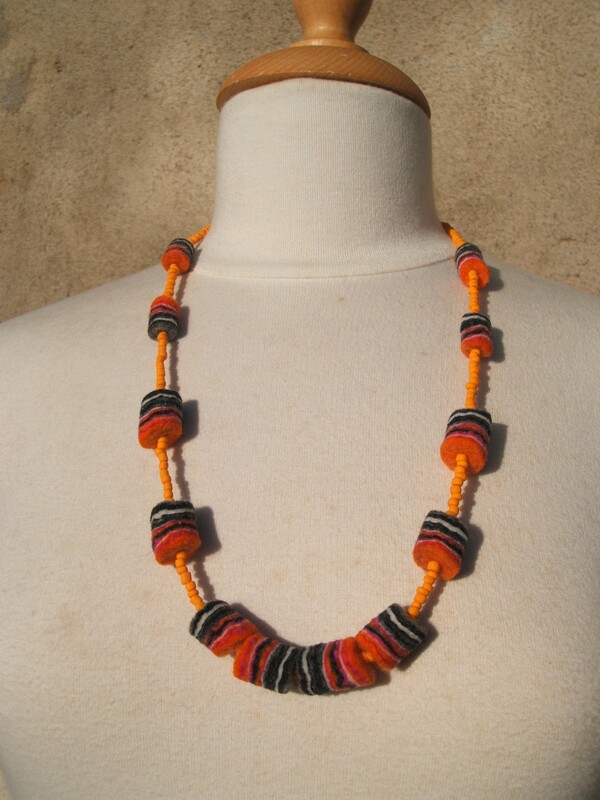 The pictured orange, grey, black, white and hot pink necklace put some of my punched beads to really good use. Normally I would not seperate these type of felt beads with anything, just string them together in a line but for some reason these screamed out to me to use cheery orange seed beads as dividers. I like the effect and went on to make some earrings with the other punched beads that I had in my stash, you can check them out on Flickr and some are already up in my Etsy shop. Speaking of Etsy, how do you price your work??? I am totally aware of the current financial situation globally and while I don’t want to undervalue what I am making I also definitely don’t want to overprice pieces and make them unaffordable to buy. 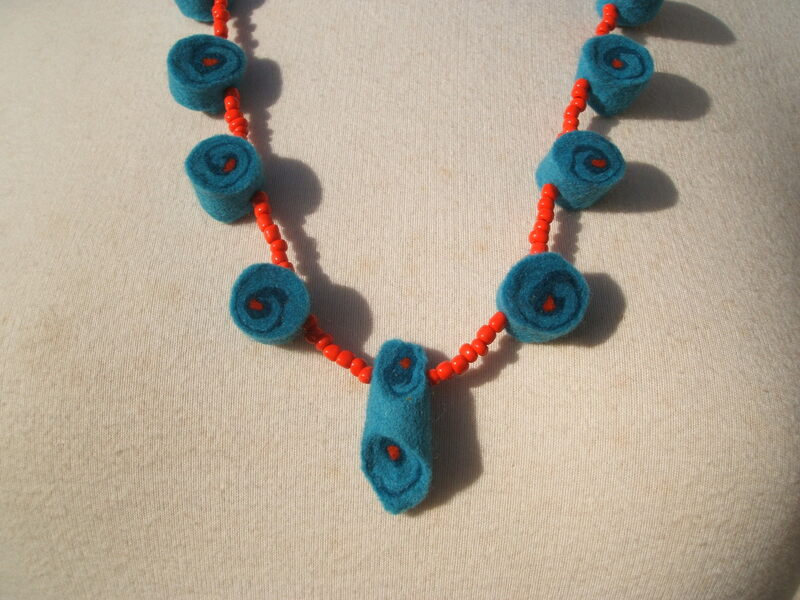 With this in mind I am constantly comparing dollar prices with euros, hopefully you will agree that $45 (E30.33 at todays exchange rate) is not too expensive for the necklace above, it does have 22 layers of merino in every bead and the felt pad which I punched them from took a full day to make! The other style of necklace that I uploaded today is retailing at $40 (E26.93), I am trying to reflect the time and skill that went into each various piece as well as the artistic merit and uniqueness or sameness of each design. These prices are an online special and only available through my Etsy store. If I am attending a craft fair or other event the prices are a little higher to reflect the extra costs accosiated with participating and travelling to shows. And finally for today ….. partners are at last assigned for the Clasheen Winter Swap. Many apologies for the week long delay, things are just hectic here and I think that we will extend the posting deadline to accomodate everyone and allay frustrations! There is still plenty of time to get your packages prepared, after all we are trying to destash as well as make a personal gift so hopefully there will not be too much shopping to do. This entry was posted in Etsy, Felt, Swaps, workshops and tagged beads, clasheen Crafty Swaps, Clasheen Winter Swap, Dutch Felt, Etsy, Felt, felt beads, felt jewellery, felt jewelry, felt necklace, Felting, seed beads by Nicola. Bookmark the permalink. I just recently found your blog and I love all your felt. I think your necklace is very reasonably priced. I own a small fine craft gallery and we carry handcrafted jewelry so I know about pricing. $45 is probably lower than what I would price it for in my store. Lovely necklaces by the way. Love your new necklaces…They’re beautiful (the seed beads really set them off, too…Great addition). I agree with Ruth that your necklace prices are very reasonably priced. While I wouldn’t want to overcharge for my work, I also don’t want to devalue it by pricing it too low. You put a lot of time, effort, creative energy (not to mention all the detail/business related things that go into posting on Etsy, record keeping, your wool costs, etc. ), into your work and deserve to be paid for that. I think that’s something that we all struggle with…Pricing…And, there’s just no easy answer, especially with the struggling economy. Hooray for Carmen for coming over so that you were able to take that much needed afternoon to while still working, relax and chat a bit…We all need that and it’s good for the soul. I can’t wait to see the heart rug project that you referred to above, using the Jacobs Fleece. What a thoughtful neighbor you have. I wrote to my swap partner last night…Can hardly wait to start planning my next package. You’re a gem…Putting this together with all that you have going on. I don’t know where you find the time for all that you do, but thank you so much. Hope your weekend workshop is wonderful. Nicola, you may want to try Dawanda where you can list items in sterling. Etsy is not the best place to try out prices since competition is fierce, many prices are below cost, and the average selling price on the site is $15. It is not a good site for figuring pricing. It might be ok for selling supplies, but not for finished products. Several other handmade only sites might be more appropriate and reach the right customers. I agree with you – the book is very interesting and inspiring and different than others – and yes this stunning rug in the vibrant red colours is still on my ‘have-to-make-once-in-my-life’ list too!